Traditional Cotton Woven Village is located 3 kilometres from Mae Chaem District Office in Tambon Tha Pha. The weaving of northern unique style Sarong is made in this tambon. Around 150 households produce this distinctive cotton. 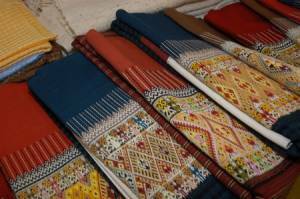 Nowadays, the unique weaving style fabric is in a great demand because of its striking colour and indigenous style. It can be purchased at a low cost for a token of souvenir. Getting there: Take Chom Thong – Mae Chaem line local truck (Song Thaeo) from Amphoe Chom Thong Market at Wat Phra That Si Chom Thong and terminates at Mae Chaem Hospital. Operating time: 9.00 a.m.-5.00 p.m.
Getting There: Take Chom Thong – Mae Chaem line local truck (Song Thaeo) from Amphoe Chom Thong Market at Wat Phra That Si Chom Thong and terminates at Mae Chaem Hospital. Operating time: 09.00-17.00 hrs. The fare is around 45 Baht. Take a chartered van or Songthaew to the village about 100 Baht.